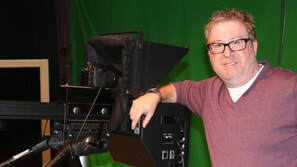 Mr. Misner joined the AHS family in 2009 after having owned and operated a video production company for over 16 years. "I am very passionate about quality video production and emphasize professionalism throughout the entire course," reports Misner. Recording Engineer: Misner graduated with a BBA with a concentration in the Music Business from Belmont University in 1985. Upon graduation, he ventured to Doraville's famed Studio One assisting Johnny Van Zant (now lead singer for Lynyrd Skynyrd). After becoming disillusioned with the music business, Misner ventured in another business, building his family business into revenues of over $1,000,000.00. But Misner's calling was to be creative and in 1993, Misner started Videotimes, a boutique video production company. As the event business grew, Misner capitalized on the "high end" event business and developed a unique style of editing with an eye on customer satisfaction. His work ethic is what built the business combined with a talent for creativity. Alpharetta High School placed one of their students in Misner's studio in 2004/2005. The student developed into a valued employee and went on to Florida's Full Sail University. Misner Joins AHS: In May of 2009, AHS contacted Misner to look at their video program with the possibility of joining their team. "I saw the potential right away," said Misner. After sitting with students that May, several students went to the principal to REQUEST Misner to teach. "There is no higher compliment than to have students request you," says Misner. Mr. Misner came onboard in August, 2009 and immediately changed the program. Changes "I now have an eye on producing our productions in HD and putting our productions online" reports Misner. Final Cut Pro was implemented within weeks of signing a teaching contract with Fulton County. The "old style" news production was changed in favor of a virtual studio; and all of the cameras were replaced with HD cameras that read from internal hard drives and SD cards. The focus on the program is to get the technology into the students' hands, increase the quality of production, and build relationships with industry and higher education. "I want my students to have what I would want for my own children," says Misner. The technology today is far less expensive than it was just 5 years ago. Misner says, "There is no excuse to not strive to produce the best we can. I want my students to build their portfolios while concentrating on good work ethic. There is no telling where they will go with the tools I am getting into their hands!" The Emmys (Student Production Awards): In 2014, The National Academy of Television Arts and Sciences recognized the productions of Alpharetta High School. AHS was awarded High School Production Awards presented at the 2014 Emmy Awards. This is a huge honor and now it has raised the bar for our students. AHS was also recognized at the 2015, 2016 and 2017 Student Production Awards for outstanding excellence in Animation, Sound, Long Form Video, PSA, Music Video, Cultural Affairs, Commercials, Onscreen Talent and so much more! Student Television Network and Other Accolades: STN recognized Misner as the 2016 Teacher of the Year for the entire country! This is a huge honor and has enabled our program to continue to be nationally recognized. In Addition, the State of Georgia recognized Misner as the Trade and Industry Teacher of the Year for 2016. In May 2016, Public Broadcasting Service (PBS) named Misner as a Digital Innovator. Misner also received outstanding achievement as "Best Video" produced by a teacher at the 2016 STN Video Conference. Leadership: In 2016, Misner was selected for the new leadership program, LEAD CTAE. This program is designed to give Career Tech Instructors a full view of how Career Tech provides the WORKFORCE of Georgia! APPLE: In 2017, Apple recognized Misner and awarded him the honor of being an Apple Teacher!